Today I made a quiche from scratch. I’m still working on the whole portion thing, but in my life, the easiest thing to do is make extra and freeze. This recipe makes two quiche with dough for four. I wanted to make a Piggery-based quiche, so I chose bacon lard as my fat. I had a bit of leftover sour cream (the liquidy part), so I used a quarter cup mixed with a quarter cup water. I was in a bit of a hurry, so rolling out the dough was not perfect (but you can see from the picture that the crust still looks okay); ideally, I would have let the dough cool another hour or so, instead of the 20-30 minutes I gave it to set. Mix or sift dry ingredients together. Cut in lard until course. Remember that lard melts very easily, so if your kitchen is warm, you may want to pop this mixture into the fridge for a bit. In a separate dish, combine water and sour cream until smooth. Beat in egg and vinegar. Make sure liquid mixture is cold enough that it won’t melt the lard, then mix liquid in until dough forms a ball. If ball is solid enough, divide into four pieces and refrigerate. Excess dough can be wrapped and frozen for future use. When you are ready to bake, remove ball of dough (one at a time) from fridge and roll out on a flour-covered surface. If you are an expert at making dough, you don’t need this piece of advice: Fold flattened dough into quarters for easier movement to an 8- or 9-inch baking dish (I didn’t grease mine, but I did add some flour to keep the dough from sticking). For the quiche recipe below, you’ll need to do this twice. If you haven’t already done so, chop and place into quiche crust (evenly dividing the ingredients between the two pies) in this order: ham, spinach, green onion, optional spicy add-on*, and mixed cheddar and mozzarella (preferably both are freshly shredded). *I like a bit of “zing” to my food. I also like to use up stuff from my kitchen that might not stand well on its own. Thus it was I came upon some incredibly spicy pickles. These were the kinds of things that no one in a sober state would ever eat. I diced into relish size about ¼ cup and added this into the pies. In a separate bowl, whisk together the eggs, cream, and salt and pepper to taste (I used very little salt, since the ham was cured). Pour over the quiche ingredients. The top of the ingredients should just be moist, not covered. You may want to use a rubber spatula to spread the egg mixture. Cook for 20 minutes and then sprinkle on 1/8 cup (per quiche) grated Parmesan. 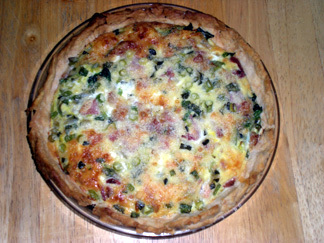 Cook an additional 15 to 20 minutes until quiche can be cut with a knife (from center). Do not burn your quiche! Crust should be puffy and brown, not overcooked. If serving at a meal other than breakfast, a nice side of greens with a light vinaigrette complements a quiche quite well.